I m a teacher in Argentina and I ve been teaching for 5 years. I ve recently joined this group and I think it s fantastic. Thank you all for everything!! 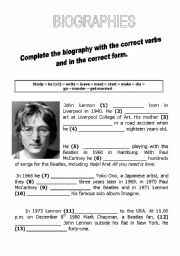 Students read John Lennon´s biography. Then they complete it with the correct vebrs in the correct form. It includes both, regular and irregulr ones. This is Elvis Presley´s biography. 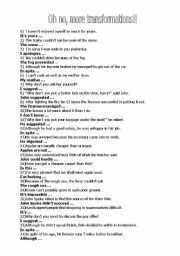 Students read and complete it writing the verbs in the simple past form. It includes regular and irregular ones. This worksheet focuses on the difficult items tested in Cambrige First Certificate Exam. Students write a new sentence sticking to the meaning of the first one. This is Bob Marley´s biography. 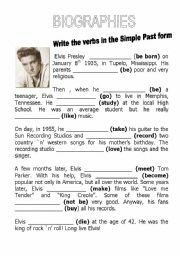 Students are asked to put the verbs in the Simple Past form. It includes both regular and irregular ones. 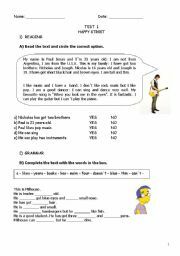 A reading comprehension test which includes True/Flase and answering questions. It is about Shakira´s life. 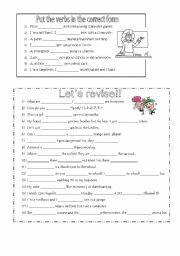 This worksheet may help your students identify and practise the difference between "is" and "has got". Simple but useful for young learners! 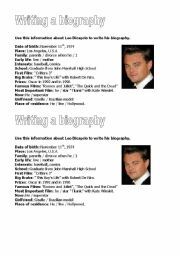 Students use some promps to write a famous person´s biography. They love it!